By interrogating the gas exchange occurring in the lungs during breathing we can learn a lot about respiratory processes. The exchange of gases (O2 & CO2) between the alveoli and blood occurs by simple diffusion: O2 diffusing from the alveoli into the blood and CO2 from the blood into the alveoli. Diffusion requires a concentration gradient. So, the concentration (or pressure) of O2 in the alveoli must be kept at a higher level that in the blood & the concentration (or pressure) of CO2 in the alveoli must be kept at a lower level than in the blood. We do this by breathing - continuously bringing fresh air (with a high percentage of O2 and much smaller fraction of CO2) into the lungs and alveoli. In conjunction with our complete system shown below, any device (i.e. 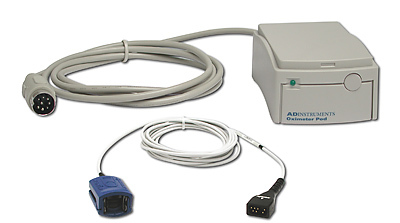 ergometer, exercise bike, treadmill) with an analog output (+/- 10V) can be connected to a PowerLab data acquisition system for synchronization of event in LabChart. So you have even more flexibility and can integrate all your data streams in one place. 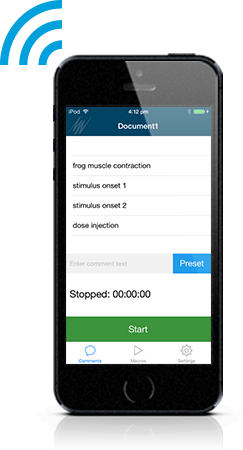 A complete physiology recording system for monitoring cardiorespiratory and metabolic function during exercise. Nasal Temperature Probes are ideal for measuring nasal air temperature as an indicator of respiration. Used to minimize effects of condensation on the flow head in spirometry studies. For use with the gas analyzer. Has a 4.7L capacity for collecting, mixing and sampling expired respiratory gases. 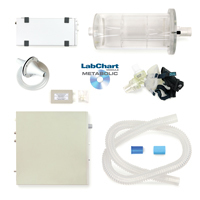 Conduct respiratory gas analysis, spirometry and metabolic studies with this basics kit (requires PowerLab and LabChart). Contains items required for collecting expired air. 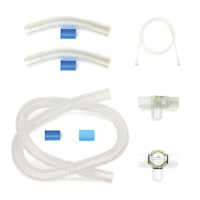 300L or 1000L flow heads suitable for use on adults in resting and exercising conditions. 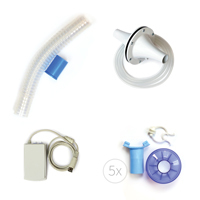 Supplied with tubing for connection to the spirometer or spirometer pod. Disposable, one-way valve mouthpieces with a length of 65 mm and outer diameter of 30 mm. They are made from white cardboard and are supplied in a pack of 100. 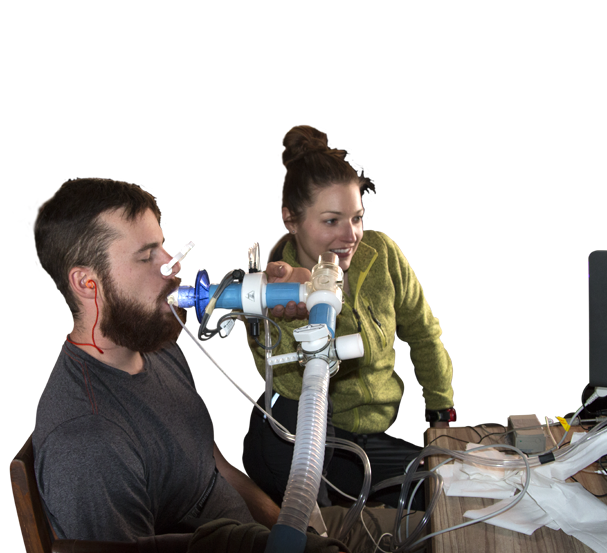 For respiratory flow circuit studies in a non-rebreathing, 2-way configuration. Included in the Exercise Consumables Kit and designed for connection of the gas analyzer to the Douglas bag. Vinyl mouthpiece (10pk) for use with disposable filters in respiratory studies. 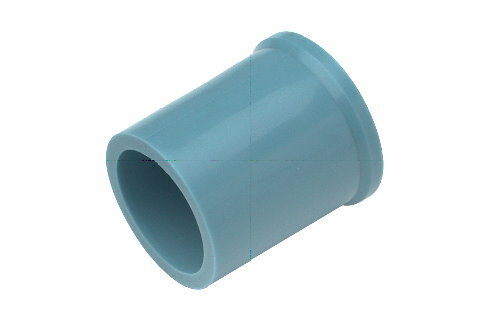 The Tubing Adapter is an autoclavable blue thermoplastic rubber that is 50 mm long. A molecular sieve desiccant for refilling the Desiccant Cartridge (1 kg ). 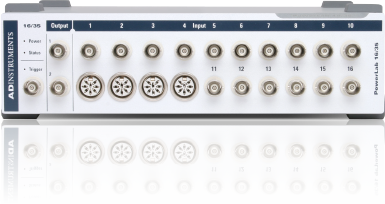 The In-line Filter connects directly to the sampling port of the Gas Analyzer to protect the transducers from moisture and damaging particulates. PVC flow head tubing with dual lumen and is ~2 m long. 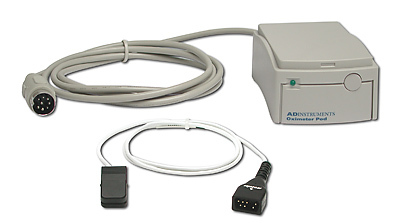 Provides an easy and reliable method of calibrating respiratory equipment. The simultaneous measurement of respiratory gas concentrations and airflow with our metabolic systems permits the calculation of the following metabolic parameters. Record pulse and blood oxygen saturation (SpO2) in relation to other signals like ECG, spirometry or blood pressure. Temperature is a useful tool in determining many factors such as subject health or the stability of an experimental preparation. It is also usefulas a calculation factor for comparing measurements taken in different states. 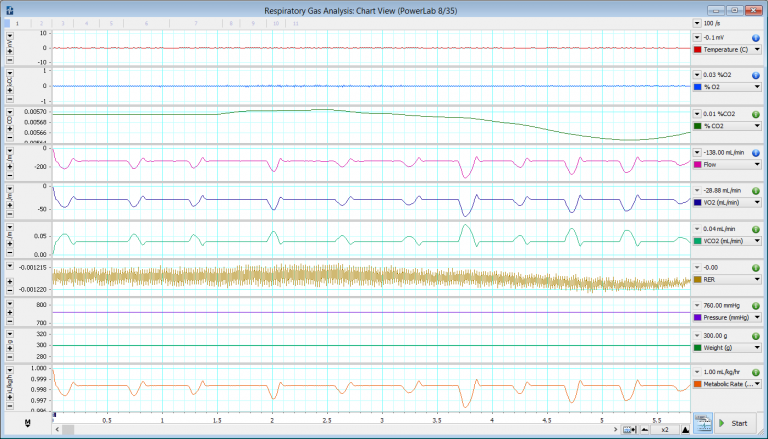 Respiratory Gas Analysis using the Exercise Physiology System and the Metabolic Add-On for LabChart. Pro Tip: RER higher than expected? RER is calculated by dividing VCO2 by VO2, therefore if the VCO2 is higher than expected but the VO2 is normal, this would explain the high RER. Alternatively, if the VCO2 is normal, but the VO2 seems low, this would also explain the high RER. In either case, the raw CO2 and O2 values should be assessed by recording known concentrations of each to make sure these are calibrated correctly. If the CO2 and O2 values are not contributing to the high RER, the flow calibration should be checked. Other factors that might cause a high RER are subject panting/breathing uncomfortable once the face mask is attached creating a higher than normal CO2 output. Another common problem can be air leaks, either from around the face mask which must be completely air tight, or within the breathing circuit. 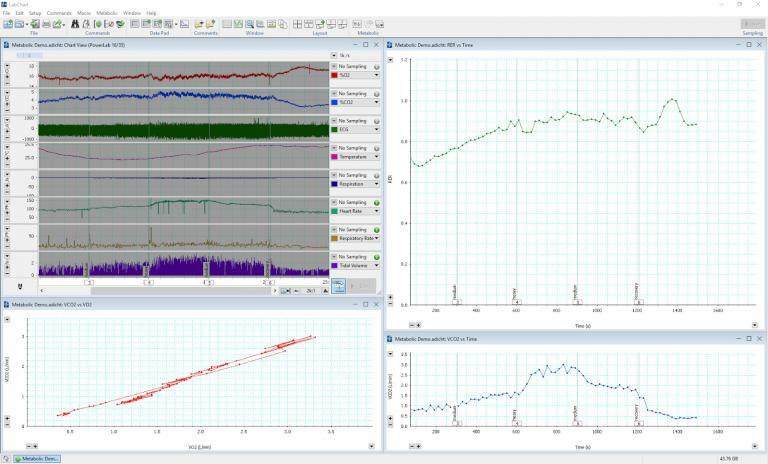 In this module you can easily calculate and display ventilatory parameters such as VCO2, VO2, VE and RER online from measurements of %O2, %CO2 and air flow. 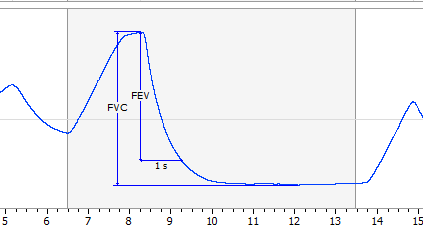 Derive multiple respiratory parameters from recorded flow and generate easy-to-read spirometry reports. 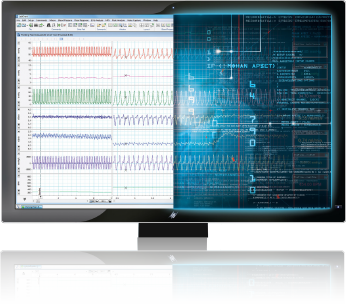 Simultaneously record and synchronize video in your LabChart data file. 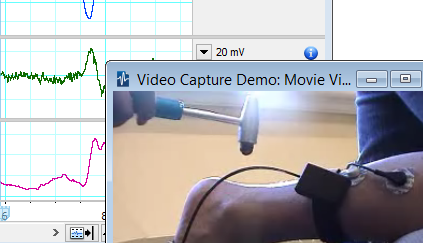 Replay to observe video and physiological data together. 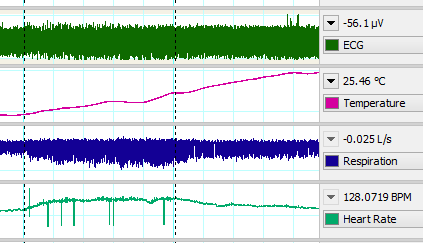 Can I switch PowerLab channel inputs for ADInstruments Front-End Amplifiers with LabChart open? What is the recommended procedure for cleaning a respiratory flow head? in Respiratory Gas Analysis on Google Scholar cite ADInstruments. Thank you for your interest in Respiratory Gas Analysis. Please complete and submit the form below and an ADInstruments representative will aim to get in touch within one working day. If you’d like to speak to someone immediately, office contact information is available from the contact page.